Christians from all over Japan have gathered for a ceremony in Nagasaki to honour 187 people who were killed as a consequence of their faith during the 17th Century. Roman Catholics maintain that the campaign against Christianity which took place in Japan in the early 1600s was more ferocious than any other religious persecution in the history of the Church. They estimate that tens of thousands of Japanese Christians were put to death, many after being tortured. During that period, Japan's shogunate rulers were attempting to unify the country and repel foreigners. They expelled missionaries from Spain and Portugal who had won many converts, especially in western Japan. Christianity was regarded as a malevolent influence on Japanese affairs. In the early part of the 17th Century, an attempt was made to eradicate Christianity altogether. At the time there were approximately 400,000 Catholics and many who did not renounce their faith were killed. Crucifixion and burning at the stake were common forms of execution. 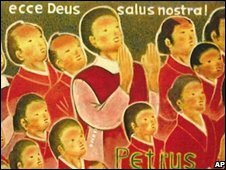 At the ceremony organised by the Roman Catholic Church in Nagasaki on Monday, 187 people who were killed between 1603 and 1639 were beatified, as well as a Japanese priest by the name of Julian Nakaura who was put to death in the late 15th Century. Beatification is sometimes regarded as a step on the path to sainthood, although in this case the church says its primary aim is to commemorate the sacrifice of the martyrs. Similar ceremonies have taken place periodically in Japan over the past 150 years. The service in Nagasaki followed historical research which uncovered new details of the Christians who died during the 17th Century. They included people from all over Japan and from all levels of society, including lay people and priests, women and children, commoners and samurai. 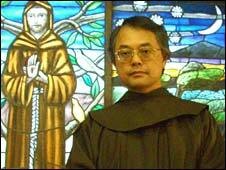 Father Paul Miki Murakami, a Roman Catholic priest in Tokyo, says: "Many Japanese people today will find it difficult to understand why the martyrs gave up their lives, but these were in a sense a spiritual elite. "Japan remains a spiritual country in some ways, but during the economic boom period of the 1960s and 1970s, many people turned from religion and began to focus more on money and secular matters. They believed a strong economy would make them happy and turned into economic animals." Father Murakami believes this is one reason why membership of the Catholic Church has declined among native Japanese in recent decades, although it has been strengthened by an influx of foreigners from Korea and the Philippines. Less than 1% of Japanese people define themselves as Christian. Most subscribe to Buddhism or the traditional faith of Shinto, although those who profess deep religious convictions are rare and it is usually regarded as impolite to talk about religion with strangers.